Six whole month's with our sweet baby AP. It still seems so crazy that she's here yet I don't remember what we did before her. She is definitely the star of this show! This post is going to be short and sweet- mainly because Mama is tired Y'all. 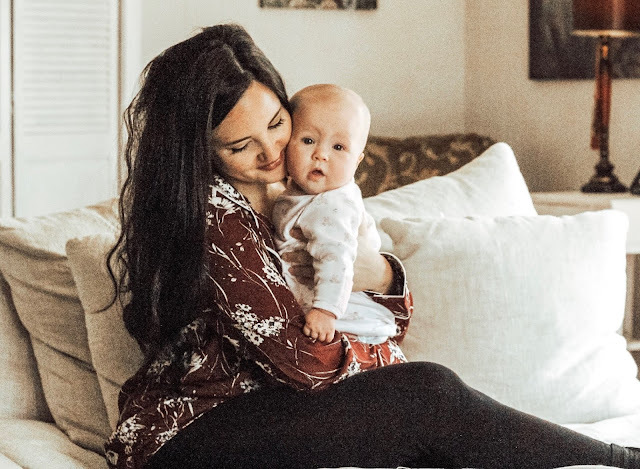 I'm going to share some a few updates and some of our favorite baby items thats we can't live without. We have our six month appointment next week but if you can tell by our pictures- AP is thriving! After our four month weight gain challenge (thankfully) haven't had anymore issues. We will find or next week her weight but I'm not at all concerned! We have tried food here and there but she doesn't have it daily. Sweet potatoes are her favorite! She's rolling around front back to front and front to back. She absolutely loves her exersaucer, sitting up on her blanket with toys and being held my mom of course. On thing that happened this month that has officially tore me to pieces is the fact that we have completely stopped nursing. I went into this pregnancy saying we would breastfeed for a year and it just didn't happen that way. I have been an emotional wreck but here is what I need to say. DO what is best for you and your baby. I have seen an entirely different baby since we started supplementing with formula. I had no clue my baby was starving. If you have to use formula please do not feel like a bad mom. Well now that we have officially stopped nursing I'm just waiting for the weight to fall off. With all of my babies I don't seem to lose weight until they wean. Thirty pounds- I still have a whole thirty pounds to go to get to my pre pregnancy weight. So on that note and all of the formula talk. Our bodies have gone through some major changes. I try to focus on staying acting, eating healthy and being happy for my family. TOYS! My absolute favorite age has to be six months. The giggles are in full force and they love play time. THIS is our current favorite toy at this age. I'm sure other mama's would agree! THESE and also THIS are other's we are loving. Anything that makes noise and they can chew on will do just fine. Now that we are exploring the world of solids we decided to get something she could sit in while we are at the table but didn't want to get an actual high chair right now. We love THIS ONE for feeding her and it's also perfect for when in in the kitchen trying to get things done. It keeps her very entertained!